Unbeknownst to the inhabitants of earth, an intergalactic police force known as the Green Lantern Corps serve as the peacekeepers of the galaxy. They congregate on the planet of Oa, where their headquarters is located. Each Lantern is armed with a mystical green ring that channels the will of it’s user to turn thought into reality. While doing battle with a fear mongering threat known as Parallax, Green Lantern Abin Sur flees his post after being mortally wounded. He crash lands on earth, where Cocky test pilot Hal Jordan (Ryan Reynolds) attempts to rescue him from his downed spacecraft. The ring chooses Jordan as Abin Sur’s successor. Hal is eventually summoned to Oa, where Lanterns Tomar-Re (Geoffry Rush), Kilowog (Michael Clarke Duncan), and Sinestro (Mark Strong) attempt to train him. They do so while contending with the growing threat of Parallax, who plans to attack them on their very home world. Back on earth, scientist Hector Hammond (Peter Sarsgaard) has fallen under the influence of the malevolent force. He becomes a puppet of Parallax, and a mortal foe to newly christened Lantern Hal Jordan. Can Jordan overcome his personality flaws and rise to the challenge? 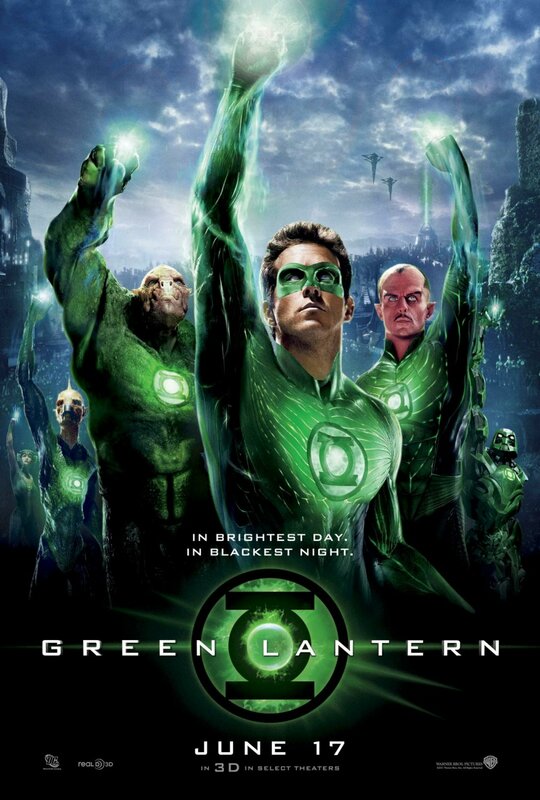 Green Lantern is an adaptation of the popular and long running DC Comics title. It is based largely on the Geoff Johns iteration of the character. Director Martin Campbell, a journeyman filmmaker who revitalized the James Bond franchise with his remake of Casino Royale, has been charged with bringing the character to life. He and his team of screenwriters have envisioned a grand sci-fi adventure that spans two worlds and contains villains both earthly and extraterrestrial. Unfortunately, they fail to invest the film with any sense of reality. Any big screen version of Green Lantern was destined to be a special effects heavy affair. It also goes without saying that practical effects would decidedly not be the tool of choice. Martin Campbell pushes computer animation to its absolute breaking point and beyond. The landscapes of Oa are vivid and colorful. The architectural surfaces have a plastic sheen that lends them a fairy tale quality. The lanterns create a variety of tools and objects with their rings, all of which are a translucent emerald green. None of it looks particularly real, but it does achieve the desired effect. The action sequences are hit and miss. Like many other elements of the film, they feel a bit detached from the whole. Fairly mundane set pieces are interrupted by genuine moments of fun and inspiration. Unfortunately, these moments are rarely sustained long enough to result in truly satisfying or awe inspiring. Perhaps the most effective of them all is a training sequence on Oa where Sinestro very simply explains what it takes to be a Lantern. It’s a competent meld of action and dialogue and is immediately reminiscent of sequential panels in a comic. The overall tone of the film severely hinders the suspension of disbelief. The characters of Green Lantern seem to regard everything with flippancy and humor. The gravity of the situation never seems to register. The best example of this is Hal Jordan himself, who regards everything around him through an impenetrable filter of glibness. That feeling permeates the entire film, robbing it of the ability to truly draw the viewer in. Green Lantern should be an immersive experience, but instead keeps the audience at bay with an ironic distance that ultimately proves self defeating. Green Lantern has all hallmarks of a fun and memorable superhero film. Instead of skillfully enticing the audience to buy into its outlandish premise, it takes their participation for granted. Suspension of disbelief is not a given. It has to be earned via effective storytelling and characterization. Martin Campbell and company have painstakingly conceived every element of this film except for the ones that matter most. Truly great superhero films require a level of commitment that the makers of Green Lantern weren’t prepared to make.